A Sinn Fein MLA has been caught on camera taking a set of bolt cutters to a wheel clamp in Belfast city centre. 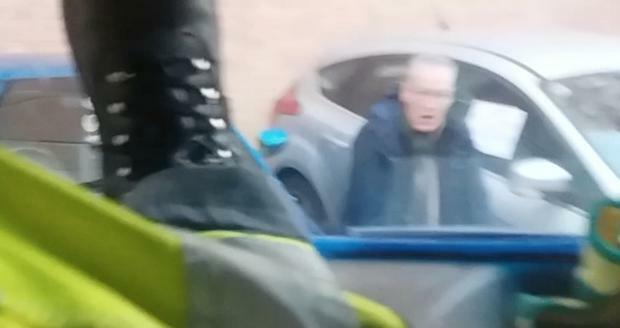 The Belfast Telegraph video shows North Belfast politician Gerry Kelly come out of a silver car in a street behind the MAC gallery. He is then seen working at it with a set of bolt cutters. Dressed in a dark suit and rain coat, the video shows him bending down to lift a set of bolt cutters before appearing to work at a chain under the car. On the driver's window of the car is a large sign which says "Stop" warning of the clamp. The footage was captured on Friday by workmen as they passed through the narrow street just behind the art gallery. "Do the rules not apply to politicians the same way they do everyone else?" asked the man who shot the video. "I couldn't believe it when I saw it. I near dropped the phone trying to get it on camera. "It was definitely the MLA." A Sinn Fein spokesperson said: "Yesterday, Friday February 2, Gerry Kelly MLA returned to his car after an early morning gym session to find that his car had been made immobile by a clamp just after 7.20 am. The footage was captured in the Exchange Street area just behind the public art gallery and theatre, The MAC. Cars can be seen parked in a yellow box on a strip of land alongside the building. The yellow box has painted across it "no parking" while there are signs on the wall saying "private parking only". A spokesman for the MAC said parking on the piece of land was enforced by a private company. It said it needed the area free for loading and in case of emergencies. “Access to a public building such as the MAC is essential, for shows, exhibitions and, most importantly, emergency vehicles. This area is clearly marked as a no parking zone, and there is signage in the area,” a spokesman said. It also said as it was a public building, it required the space free for emergencies. The parking enforcement company PEA said in incidents such as someone removing a clamp without authorisation a report would normally be made to police. “PEA is aware of this incident and has reported the matter to the PSNI as we do in all such cases,” a spokesman said. A PSNI spokesperson has said: "Police in north Belfast received a report of criminal damage in the Exchange Street area of Belfast at around 2.20pm on Friday February 2. "It is believed that damage was caused to the wheel-clamp of a car."